This late 17th century lodge, with a wealth of oak beams, offers a traditional carvery menu together with fish and vegetarian selection, bar meals and snacks. Open every day for breakfast 7.00-9.30 a.m (8.00-10.00 a.m. Sat/Sun), lunch 12.00-2.00 p.m, dinner 6.00-9.30 p.m. and all day Sunday. 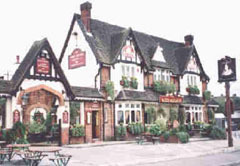 Traditional carvery menu with fish and vegetarian selection, bar meals and snacks.